A relaxing, creative and sociable way to spend a Saturday morning or afternoon. Have a go on the wheel and hand building a piece. We will glaze and fire your work for you to pick up at a later date. An introduction to throwing and turning on the potter's wheel. By the end of the 3 weeks you will have made a set of mugs or similar which will be glazed for you. Class size of 5 max means lots of individual attention. Join us for a fun-filled day of all things clay. Suitable for beginners and those with some experience, you will be introduced to many techniques including pinching, coiling, slabbing and throwing. You will have time to experiment and decorate your pots. Lunch not included but we have many lovely cafes on our doorstep! Spend a focused hour and a half on the potter's wheel. 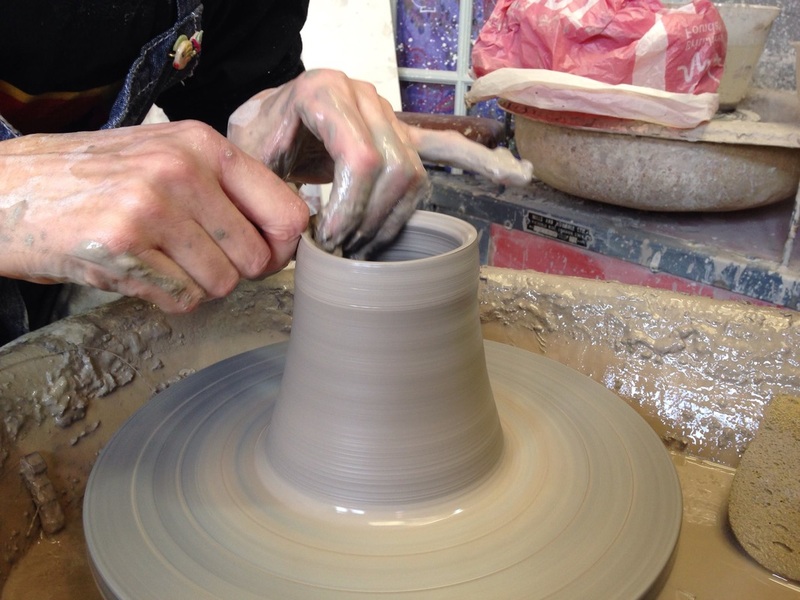 You will be given a demo and then have the chance to make pots on your own wheel. Small groups of maximum 5 people so all will get lots of individual attention. they will be charged at £5 per pot. This class is designed as a more affordable option for individual throwers who are beginners. If you are a group, look at the private throwing classes. coiling, slab building and throwing. We have a waiting list system where we contact you when spaces become available - email us with a mobile contact number to go on the list. These classes are very popular so be patient as the waiting list is significant. Children will taught how to make and decorate unique pieces, using a range of pottery techniques. The tutor (Alice) has a Primary PGCE, current DBS check and many years experience teaching pottery to children. We can arrange private children's or family classes for you. We will teach simple hand-building techniques and each person will get a go on the potter's wheel. 3 or more people required for a workshop including at least 1 child. ​We fit these classes around our regular classes, let us know when is good for you. Spent a focused hour or more on the potters wheel. You will get a thorough demo then make a few pots each on your own wheel. ​This can make a great date! Have a go at throwing and decorating one pot which we will glaze and fire for you. We fit these classes around our regular classes, let us know when is good for you. We are happy to tailor any private sessions to your needs- call us or pop in to talk about what you would like to do. ​As a not for profit, community pottery, our fees are kept as affordable as possible but we need to maintain full attendance in all classes to allow this to continue. Therefore, classes and workshops must be paid in full at the time of booking/confirmation and rearrangement of your class date may only be possible with at least 2 weeks notice. Please ensure you can attend the class before you book in with us, as refunds cannot be made. If you have booked a private throwing class or family workshop rearrangement of your class will be considered with less notice .